Natural diamonds display differences in their properties from man-made diamonds due to the different growth conditions in which they form. Crystal Shape: The temperatures for natural diamond crystal growth and diamonds made in the laboratory are similar, but diamonds grow as octahedral (eight equilateral triangular faces) crystals and man-made diamonds crystals grow with both octahedral and cubic (six equivalent square faces) crystals. Natural and man-made growth environments result in diamond crystals with distinctive shapes. From left is a comparison of CVD, HPHT and natural diamonds. Octahedral faces are shown as yellow and cubic faces blue. Most natural diamonds grow as octahedral (right), but HPHT diamonds (center) typically show a combination of cubic and octahedral faces. Octahedral faces are completely absent in CVD diamonds (left). Directions of crystal growth are shown by arrows. Dotted lines represent the position of the seed crystal in the HPHT diamond and the edges of the crystal in the CVD diamond. 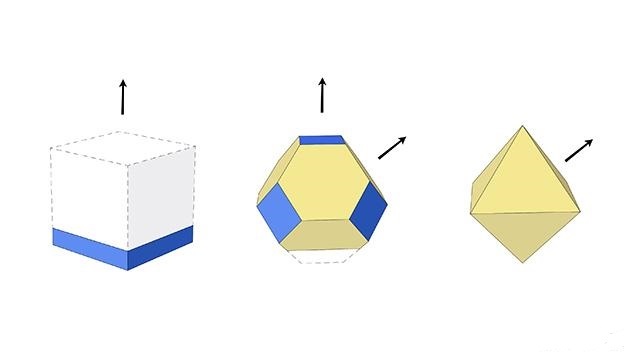 Cube faces grow more quickly than octahedral faces. They are preserved on synthetic diamonds, but they are not preserved on natural diamonds. 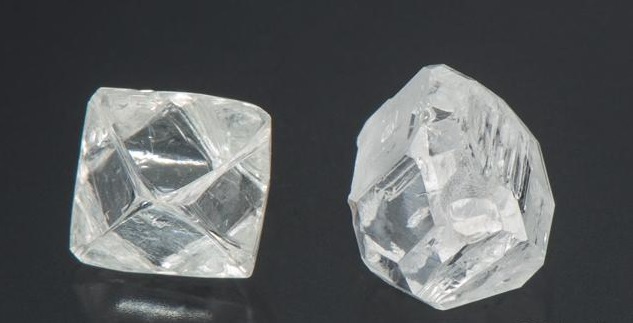 A comparison of rough diamonds shows a 0.83 ct natural diamond crystal on the left and a 1.02 ct HPHT crystal on the right. Inclusions: Natural and man-made diamonds can exhibit various inclusions (fractures, breaks, other crystals, hollow tubes) so they are not always diagnostic tools for gem identification. Color: Man-made diamonds are commonly colorless, near-colorless, light to dark yellow or yellow-brown; they are less commonly blue, pink red or green. Man-made diamonds can be subjected to the same color treatments as natural diamonds, so any color is possible. Clarity: Man-made diamonds can be from low to high clarity. Cut: The cut of a man-made diamond is the same as a natural diamond - any cut is possible. Round brilliant is the most common shape and cutting style of colorless man-made diamonds. Colored man-made diamonds and larger man-made diamonds are more often fashioned into a fancy shape to retain more weight from the original crystal. The shape of the crystal also influences the choice of faceting styles. • Same physical hardness as a mined diamond. • Same optical properties as a mined diamond. • Same Molecular structure as a mined diamond. • Will never have any fluorescence. • Will give you around a 20% bigger diamond for the same budget. • Often a cleaner diamond with less inclusions. • Are completely certified and laser inscribed by the one of the worlds forensic laboratory (only 2 in existence), that even has a money back guarantee, if the stone hasn't been accurately graded.